The party's best ever performance was in 1992 when it won 87 seats in the elections which were boycotted by main Akali Dal in the wake of threats from radical Khalistani elements. 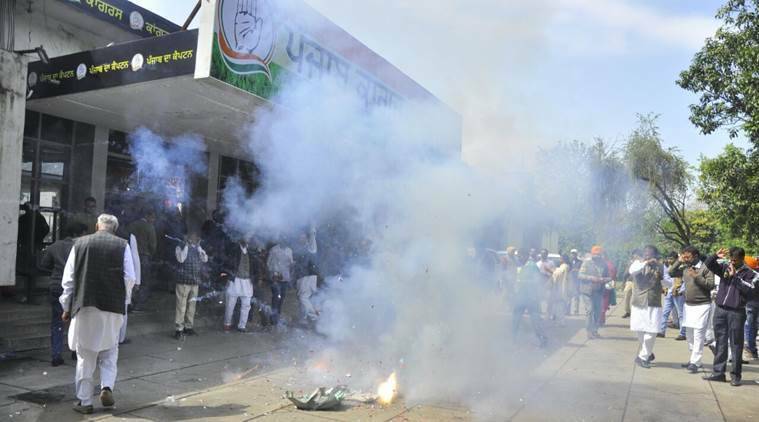 Congress’ return to power marks its second best performance in the assembly elections in Punjab since its reorganisation in 1966 when Haryana was carved out as a separate state. Congress has won 77 seats in the 117-member state assembly after projecting state unit President Amarinder Singh as its chief ministerial nominee. The party was one short of 78 – figure required for two-thirds majority in the assembly. The party’s best ever performance was in 1992 when it won 87 seats in the elections which were boycotted by main Akali Dal in the wake of threats from radical Khalistani elements. The opponents of the elections then called for the boycott saying the Centre had failed to take steps to meet longstanding Sikh demands, including the release of detainees, greater political and economic autonomy and more water for irrigating its drought-prone regions. The 1992 elections were held amid a huge deployment of security personnel and the Punjab police. Incidentally, a splinter Akali group led by Amarinder had contested the 1992 elections fielding 38 candidates, but only three could win. The three included Amarinder who was declared elected “uncontested” from the Samana assembly constituency in Patiala district. The other SAD winners were Ranjit Singh (Khadoor Sahib) and Inderjit Singh (Zira). The SAD faction had fielded 58 candidates out of which three won and 38 forfeited their security deposit. But this time the Congress has put up its second best performance with Amarinder in the lead. He won from Patiala Urban seat, but lost to Chief Minister Parkash Singh Badal from the Lambi constituency. The three other 60-plus seats performances of the Congress have been in 1972 (66 seats), 1980 (63) and 2002 (62) when Amarinder first became chief minister. Congress won 40-plus seats thrice in 1967 (48 seats), 2012 (46) and 2007 (44). The party won 38 seats in 1969, 32 in 1985 and its lowest 17 in 1977. Vote-wise the best performance of Congress was in 1980 when it got 45.19 per cent vote share, followed by 43.83 per cent in 1992, 42.84 per cent in 1972, 40.90 per cent in 2007 and 40.09 per cent in 2012. Its worst performance was in 1997 when it got a vote share of 26.38 per cent. This time, Congress won 77 seats and was followed by new entrant AAP with 20 seats, SAD with 15, BJP with 3 and Lok Insaaf Party, a pre-poll ally of AAP, with 2 seats.